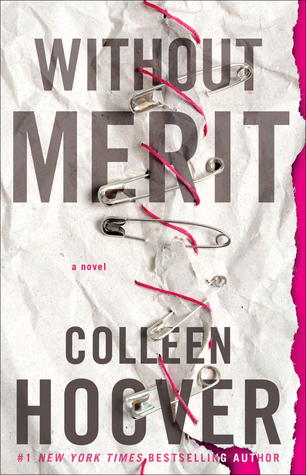 In Colleen Hoover’s gripping novel, reminiscent of the bestselling works of Liane Moriarty and Jojo Moyes, a young woman decides to reveal the dark secrets of her seemingly-happy family before she leaves them behind, but when her escape plan fails, she must deal with the staggering consequences of telling the truth. Well well well.. what have we here??? I have avoided Colleen Hoover for AGES. I keep hearing she's wonderful. I keep hearing I HAVE to read her books. I read ONE (well technically three, since there were three separate parts) book of hers that she did a collaboration with and it was just OK. I have a couple of her books on my shelf and on my Kindle but SOMETHING kept me from opening page one of any of them. Why? Why did I wait so long? This book is fantastic. And at the expense of not sounding like my age, IT GAVE ME ALL THE FEELS. How do you write a review about this without giving away any spoilers? Well, I'm going to do my best so read on with no worries. Merit is a high school drop out who lives in a house with a dysfunctional family. Her father, his new wife, his ex-wife, her twin sister, her twin sister's boyfriend and her brother. Did you catch all that? As the synopsis states, she reveals some dark secrets that have been plaguing her for quite some time before leaving her family behind. Things, as usual, never go according to plan and now she has to deal with the repercussions.